CHESTNUT HILL, Mass. 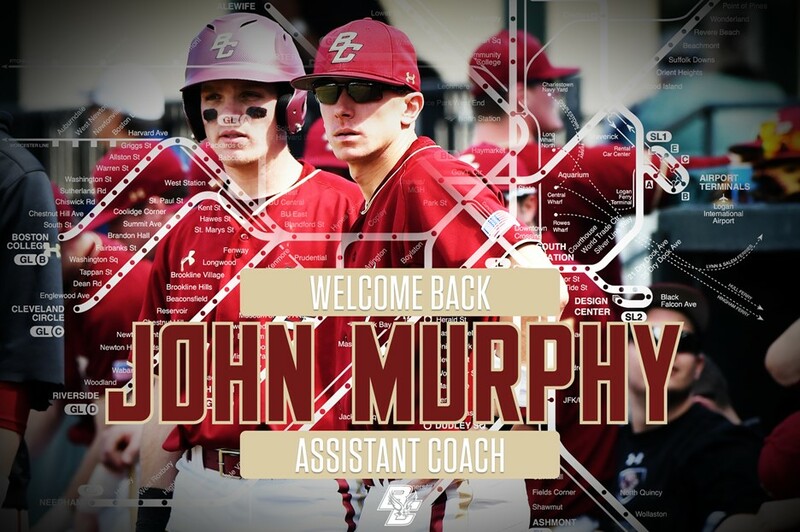 – The Boston College baseball team announced the addition of John Murphy to its staff as an assistant coach. Murphy, who spent 2018 at Army West Point, begins his third season overall with the Eagles in 2019 after serving as the team’s volunteer assistant for the 2016 and 2017 seasons. In his one season as the Black Knights’ hitting coach, Murphy helped Army head coach, and former BC pitching coach, Jim Foster reach the NCAA Raleigh Regional. Army posted an overall record of 37-24 and won the Patriot League at 18-7. The Black Knights hit .263, which ranked second in the conference, scored a league-high 331 runs and stole a league-leading 92 bases. Murphy’s duties with the Eagles will include recruiting, working with hitters and infielders, and video analysis. In 2016, he aided the Eagles to their first NCAA Tournament appearance since 2009, first ACC Championship appearance since 2010 and first-ever appearance in the Super Regionals after BC swept the Oxford Regional. The Eagles tied for the second-most win in school history and the fourth-best fielding percentage. No stranger to NCAA Regionals as a coach and player, the Seymour, Conn. Native was the starting shortstop for four seasons at Sacred Heart as he helped the Pioneers to Northeast Conference titles and NCAA Regional appearances in 2011 and 2012. He was named to the American Baseball Coaches Association All-America third team as a senior in 2013. He earned All-NECC First Team honors as a senior and Second Team recognition as a junior. Murphy was named to the All-NEC Tournament team in 2011, in which he was the Tournament MVP, and 2012. Murphy, the highest draft pick in SHU history, was selected by the New York Yankees in the 2013 sixth round. He spent two seasons in the Yankees’ organization in the New York-Penn League and South Atlantic League. Murphy earned his bachelor’s degree in psychology from Sacred Heart.